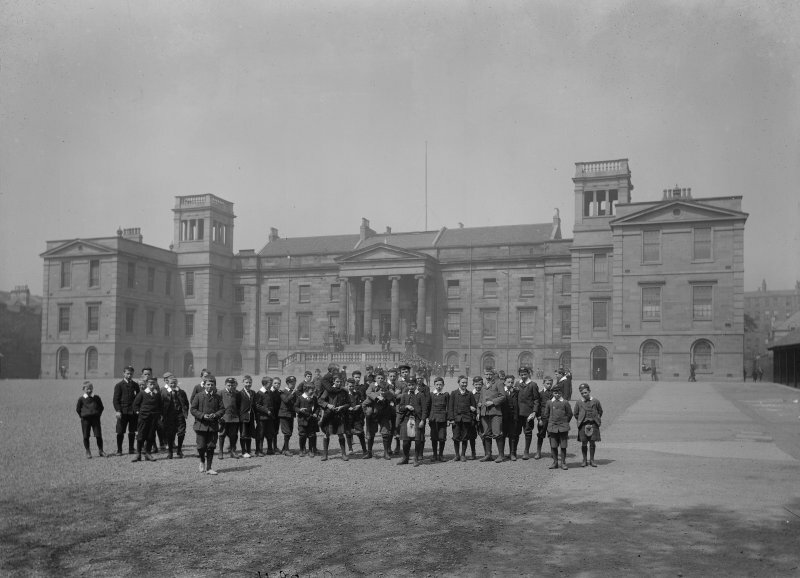 General view of front from south east, with pupils in front presumably from George Watson's Boys College. 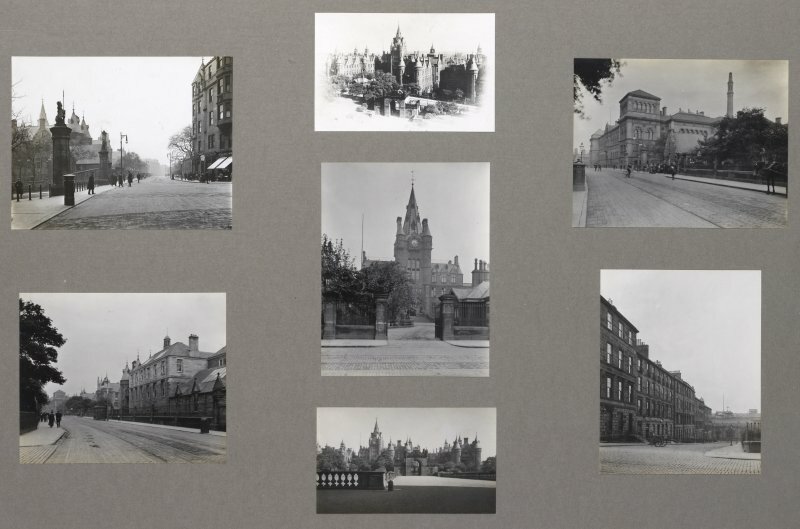 Card folder containing photographs of West Meadows and Bruntsfield Link areas, including George Watson's Boys College, Glengyle Terrace and Barclay Church, and Leven Terrace, and an old print of the new Merchant Maidens Hospital, now George Watson's Boys College. Front cover has pencil notes describing the photographs inside. Edinburgh Photographic Society Survey of Edinburgh District, Ward XIV George Square. 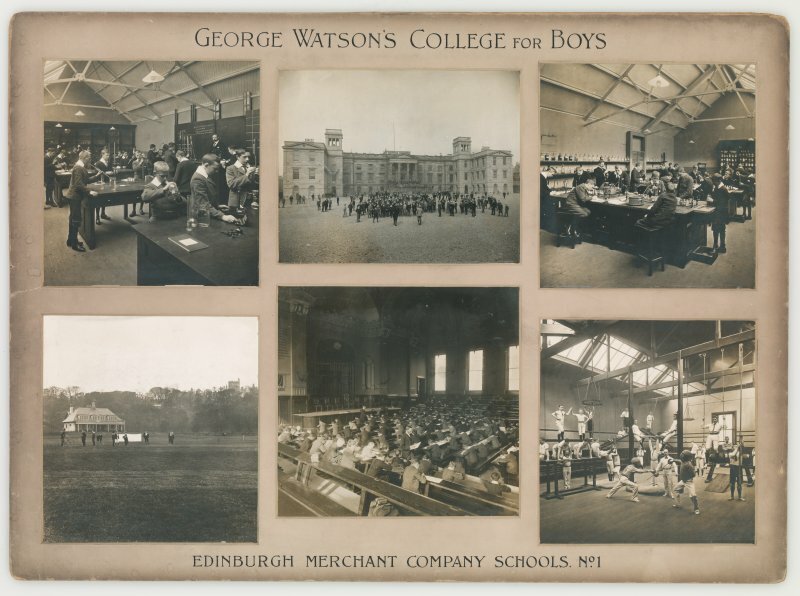 Exterior view of George Watson's College for Boys, Edinburgh. Building since demolished. Titled: 'George Watson's College for Boys. Edinburgh Merchant Company Schools No1'. 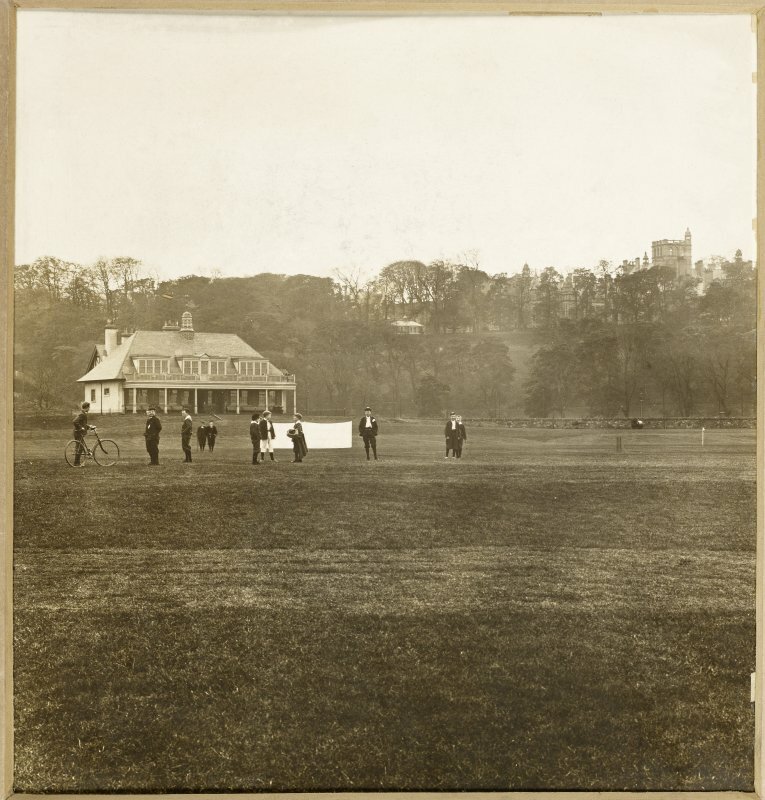 View of playing field and building at George Watson's College for Boys, Edinburgh. Titled: 'George Watson's College for Boys. Edinburgh Merchant Company Schools No1'. Card folder containing photographs of West Meadows, North side, includingold Buccleuch Parish School,Boroughloch Buildings. 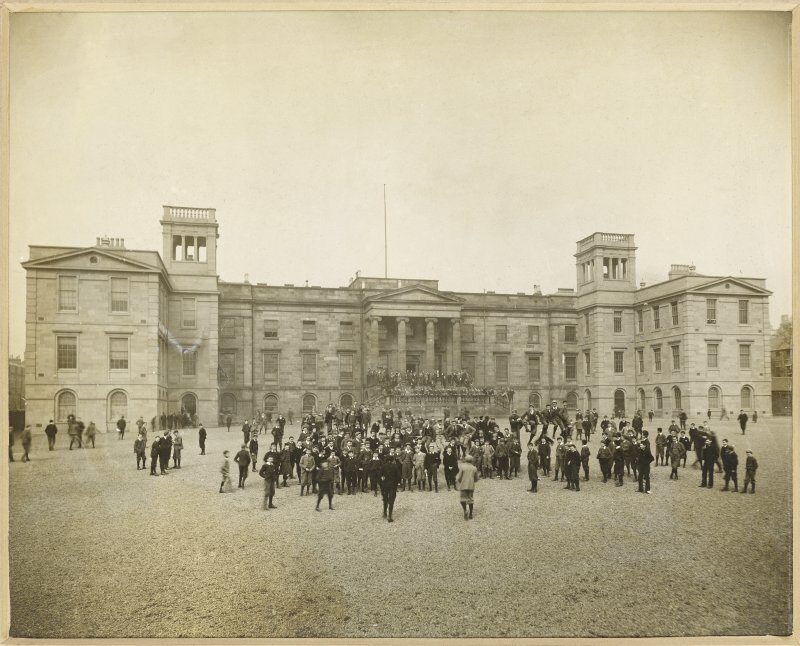 George Watson's Boys College and the Royal Infirmary. Front cover has pencil notes describing the photographs inside. Edinburgh Photographic Society Survey of Edinburgh District, Ward XIV George Square. 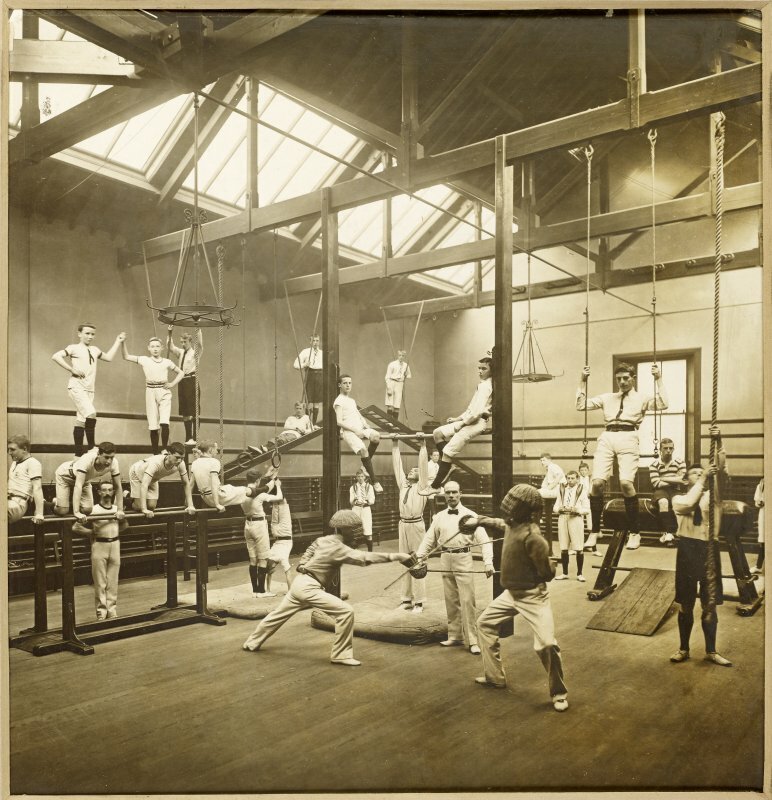 Interior view of George Watson's College for Boys, Edinburgh showing gymnasium. Titled: 'George Watson's College for Boys. Edinburgh Merchant Company Schools No1'. 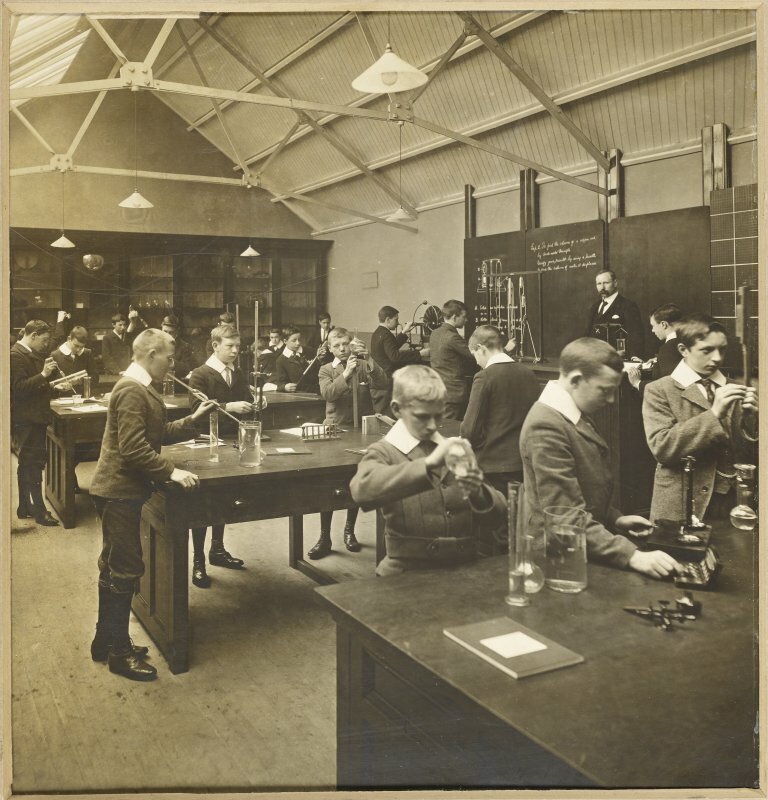 Interior view of George Watson's College for Boys, Edinburgh showing laboratory room. Building since demolished. Titled: 'George Watson's College for Boys. Edinburgh Merchant Company Schools No1'. 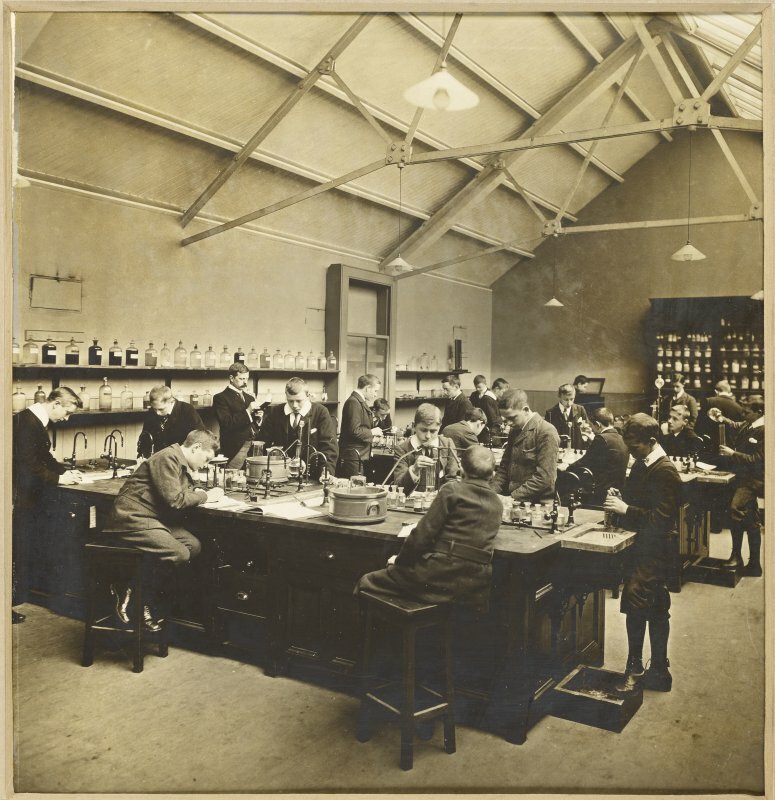 Interior view of George Watson's College for Boys, Edinburgh showing laboratory room. Titled: 'George Watson's College for Boys. Edinburgh Merchant Company Schools No1'. 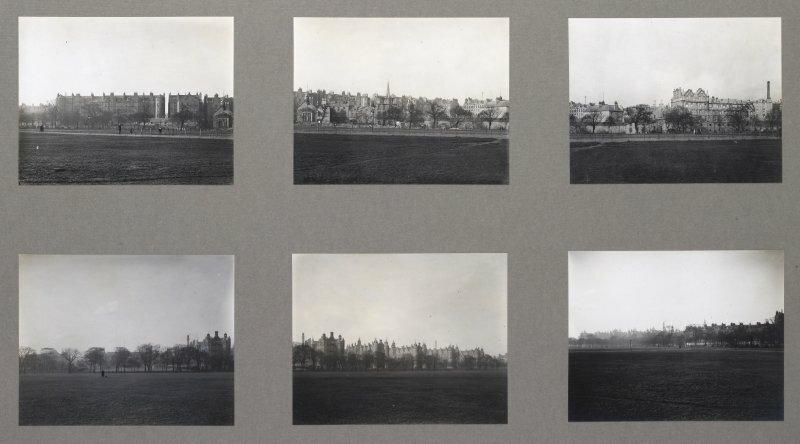 Six mounted photographs showing interior and exterior views of George Watson's College for Boys, Edinburgh. Building since demolished. Titled: 'George Watson's College for Boys. Edinburgh Merchant Company Schools No1'. 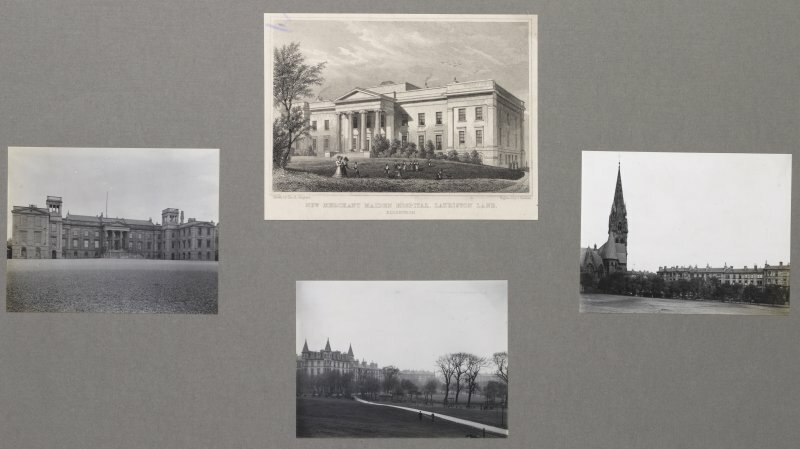 Card folder containing photographs of Lauriston Place, Royal Infirmary and Archibald Place. Front cover has pencil notes describing the photographs inside. Edinburgh Photographic Society Survey of Edinburgh District, Ward XIV George Square. 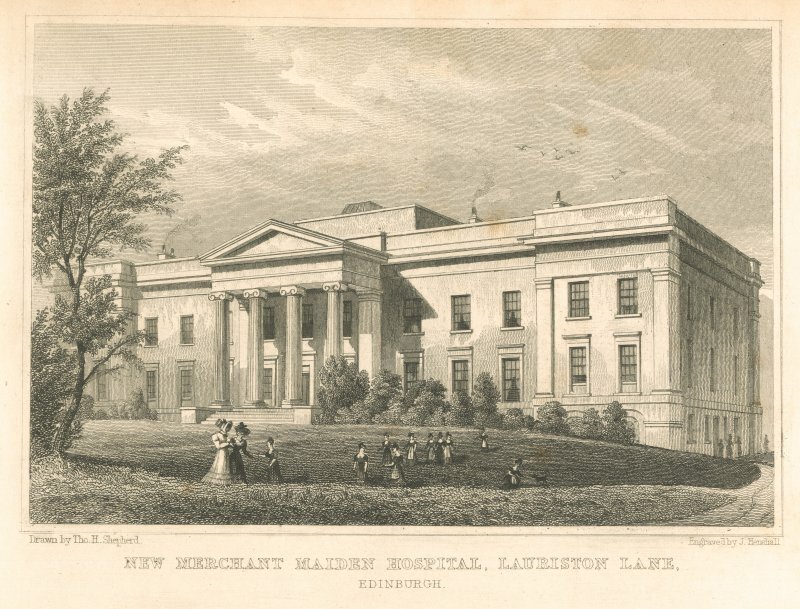 Photographic copy of engraving insc: 'New Merchant Maiden Hospital, Lauriston Lane. Drawn by Tho.H.Shepherd. Engraved by J. Henshall'. Copied from Modern Athens. 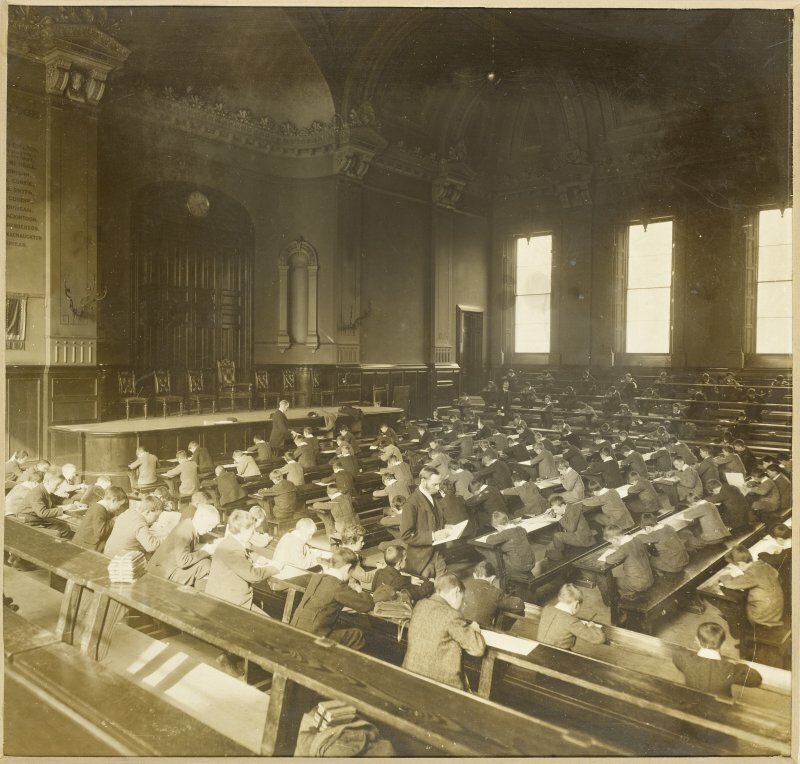 Interior view of George Watson's College for Boys, Edinburgh showing class room. Titled: 'George Watson's College for Boys. Edinburgh Merchant Company Schools No1'. NT27SE 480 Edinburgh, Lauriston Place, Royal Infirmary. The Merchant Maidens' Hospital was founded in 1694 and initially housed in the Company of Merchants' own halls in the Cowgate. 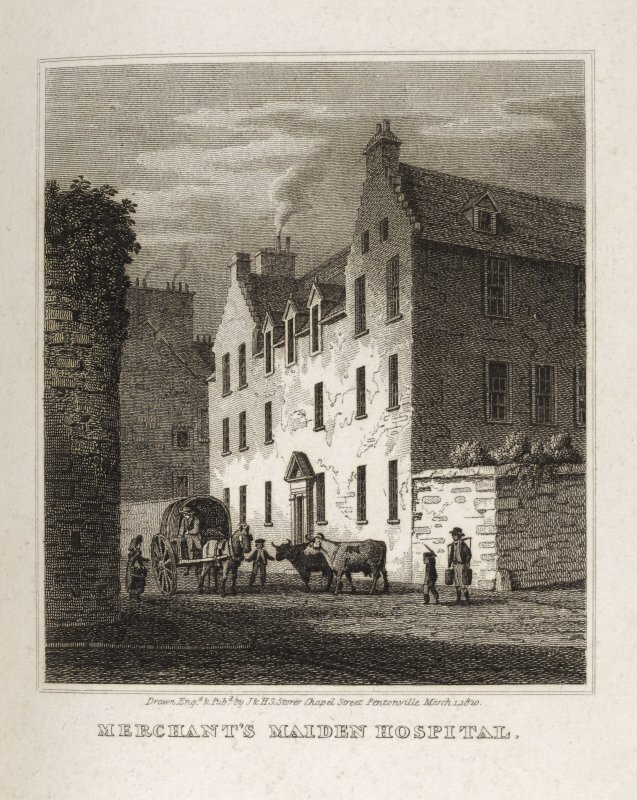 The Hospital moved to Bristo Street in about 1706, to a site purchased by Mary Erskine. However, by the start of the 19th Century the governers were resolved on the contruction of a new hospital. Robert Reid, Richard Crichton and a Mr Harvey supplied plans for a hospital in Lothian Street, 1805 - 1812. This was never built; instead, in 1816, the new building in Lauriston was commissioned. The Merchant Maidens resided here from 1818 until 1870, when they removed (as the 'Edinburgh Educational Institution for Young Ladies') to Queen Street. (See Tovill, in Bibliography, for Merchant Maidens Hospital history). 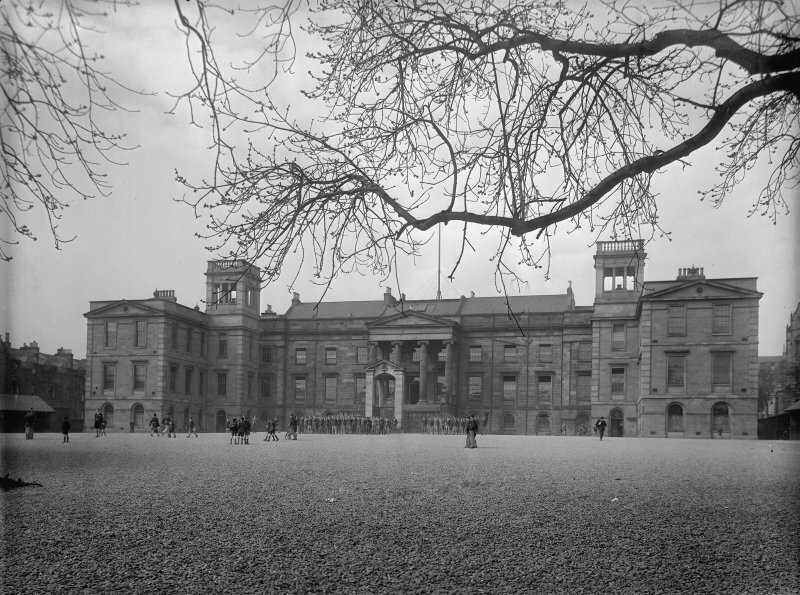 From 1870 to 1933, the premises were occupied by George Watson's Boys College. 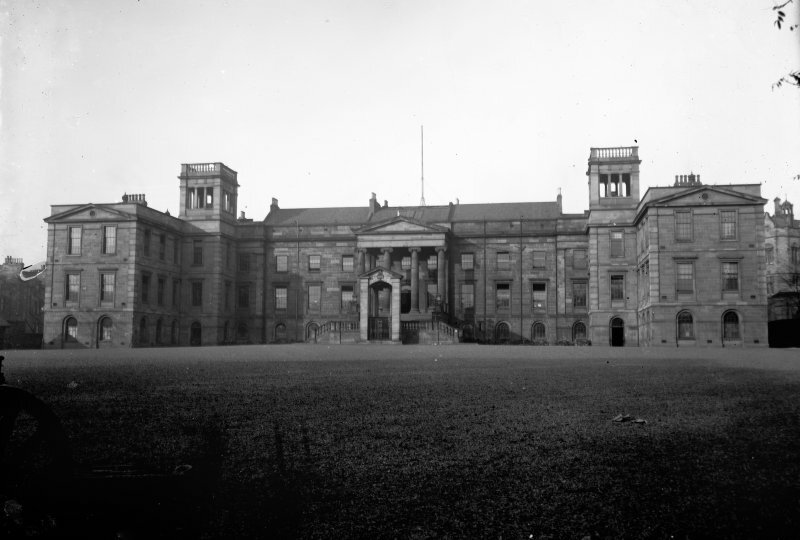 However, the site was purchased by the Royal Infirmary for its expansion plans, and the College moved to Colinton Road. Burn's building was demolished, and the Simpson Memorial Maternity Pavilion and Florence Nightingale Nurses' Home built in its place. Newscutting, March 4th 1933, source unknown - photograph. Missing at time of upgrade (10.12.1997). artefacts were discovered during these evaluation works. Work on these two areas was undertaken during 2006 and 2007. The war memorial was constructed infront of the main entrance to the school. When the school moved to Colinton Road the war memorial was removed and built beside the new school buildings (see NT27SW 1698). Information from RCAHMS (AKK) 30 June 2014.